VANCOUVER, Aug. 28, 2013 /CNW/ - The Honourable Candice Bergen, Minister of State (Social Development), today announced new measures introduced by the Harper Government that will help equip young Canadians with skills and work experience to get jobs in high-demand fields. "Our government is committed to creating jobs, economic growth and long-term prosperity all across Canada and right here in Vancouver," said Minister of State Bergen. "Initiatives like this will connect youth with in-demand jobs while ensuring that Canada's economy benefits from the skills and talents of young Canadians. By investing in youth today, we are making sure they are ready to become Canada's future workers and contribute to our long-term prosperity." Skills and labour shortages are some of the biggest obstacles to Canada's economic growth. The Youth Employment Strategy will provide $24 million to help over 1 900 youth in projects across the country. This will give young people the hands-on experience they need to start their careers in high-demand areas such as the skilled trades, tourism and health sciences, and also help employers address acute skilled labour shortages. Minister of State Bergen made the announcement at the YMCA of Greater Vancouver. This organization is benefiting from more than $1.4 million to help post-secondary graduates gain useful work experience for their future careers through paid internships in high-demand fields such as mining, transportation and health care. These private sector work placements will take place with employers in British Columbia, Alberta, Saskatchewan, Manitoba, the Northwest Territories and Yukon. The YMCA of Greater Vancouver is also benefiting from more than $546,000 through this initiative to provide youth in the Lower Mainland, Okanagan and Vancouver Island regions with on-the-job experience. "The YMCA is committed to helping youth and young adults reach their full potential through its employment programs," says Steve Butz, President and CEO, YMCA of Greater Vancouver. "Thanks to the funding the YMCA of Greater Vancouver has received from the Government of Canada, we will be able to continue to help youth facing significant barriers to employment, those entering the labour market for the first time, and young adults lacking sufficient education or experience to advance in today's labour market." 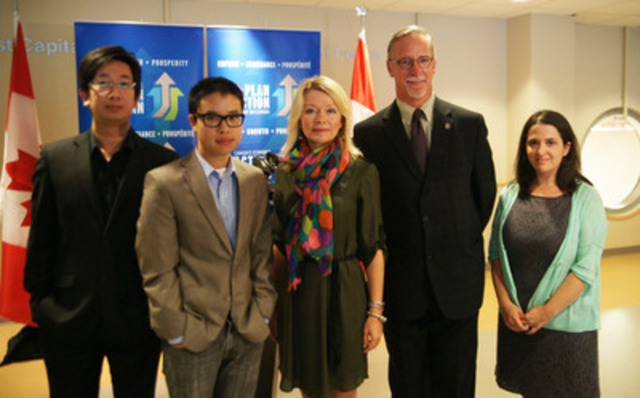 Youth employment programs are part of the Government of Canada's strategy to connect Canadians with available jobs. Economic Action Plan 2013 proposes new measures to equip Canadians with the skills and training they need to fill skills shortages and succeed in the Canadian labour market. These new measures include the Canada Job Grant, which will invest in skills training for unemployed and underemployed Canadians, better ensuring they are qualified to fill the high-quality, well-paying jobs available. Economic Action Plan 2013 is also creating opportunities for apprentices and providing support to under-represented groups such as Canadians with disabilities, Aboriginal people, newcomers and youth. To learn more about Canada's Economic Action Plan, visit actionplan.gc.ca. This news release is available online at actionplan.gc.ca. With annual funding of approximately $300 million, YES helps youth—particularly those facing barriers to employment—obtain career information, develop skills, find jobs and stay employed. YES includes the Skills Link and Career Focus programs, and the Canada Summer Jobs initiative, which creates thousands of job opportunities for students every summer. Since 2006, the Youth Employment Strategy has helped more than 555 000 young people upgrade their skills, to the benefit of the Canadian economy. Skills Link helps youth facing barriers to employment—including single parents, youth with disabilities, young newcomers and youth in rural and remote areas—to develop the skills and gain the experience needed to find a job or the confidence to return to school. Skills Link is receiving over $4.9 million through this Economic Action Plan initiative to connect youth with in-demand jobs. Since 2006, the Skills Link initiative has helped over 179 000 young people find better employment or return to school for skills upgrading. Career Focus provides funding to employers to hire young post-secondary graduates to give them career-related work experience and help them acquire skills to transition into the job market. Career Focus is receiving over $19 million through this Economic Action Plan initiative to connect youth with in-demand jobs. Since 2006, the Career Focus initiative has helped over 26 000 post-secondary students acquire crucial skills and transition into the labour market.